Dunkin Construction is the official distributor for Spain of Kemset Building Materials. New generation materials specialised in thermal insulation. Apply over solid backing of concrete, cement block, brick, drywall, plasterboard, OSB, steel structures and many other substrates. Mix and apply EkoPlast-50 when the ambient and surface temperature is at least 40° F and rising. Ambient and surface temperature must not exceed 120°F during and 24 hours after application. Surfaces must be structurally sound, clean, dry and free of dust, dirt or other contaminates impairing bond. Prepare the surface to be smooth and free of cracks, holes and voids. For every bag of EkoPlast-50 use 3 gallons of water (Add water if needed to achieve desired consistency). Place quarter of the water in the mixing container and mix while slowly adding a bag of EkoPlast-50 and the rest of the water. Mix for 6 to 8 minutes until it reaches a homogeneous consistency. 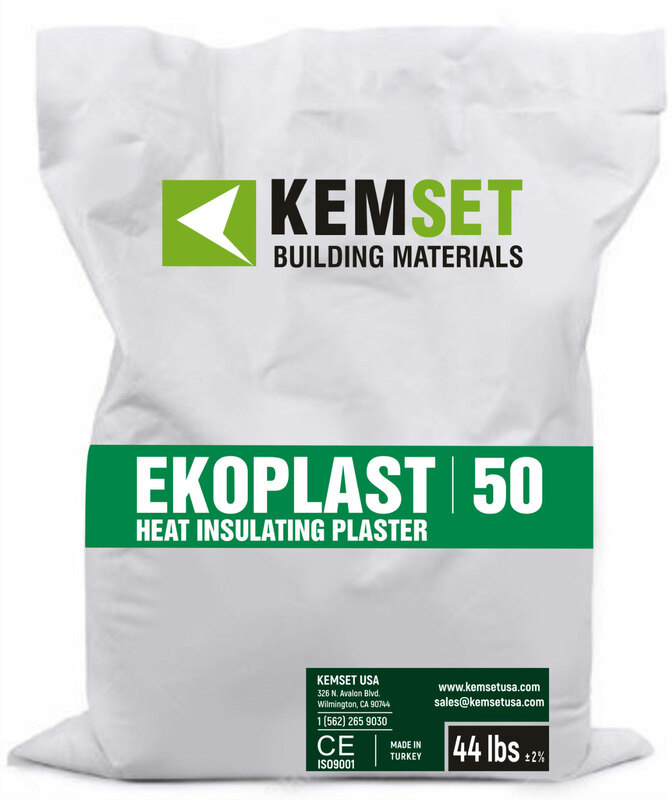 Apply EkoPlast-50 by trowel or pumpspray in such a way to press the material into the substrate for bond strength. Apply a minimum thichness of 3/8" over existing surface. On new installations apply a minimum of 3/4" and up to 1" thicness can be applied in a single coat. Use screeds where necessary to control the thichness for an even flat finish.